For many of us, once winter rolls around and the days get shorter, it can be difficult to drag yourself out from under the covers. Seasonal affective disorder comes on like a dark cloud to drag you down with feelings of hopelessness and despair. You wake up to darkness, and by the time you leave work, what little daylight there was in the afternoon is gone. People around you start to close up, hunching their shoulders and moving about with the sole intention of getting to where they’re going. What is it about this seasonal shift that shifts our mood so drastically? Despite the cold, studies have shown that the temperature shift is not the main suspect for feelings of seasonal depression. It is instead the lack of daylight, more than the shift in any other atmospheric phenomena, which leads to feelings of depletion. Psychologist Mark E. Beecher of Brigham Young University conducted a study involving 16,452 adults that analyzed therapeutic distress across 19 weather and pollution variables over a six-year period. He found that seasonal increases in the amount of time spent in the sun were linked to decreased emotional stress—whereas temperature and pollution variables had no effect. These results are surprising: One would think that weather, temperature, and pollution would have a profound effect on mood. Rainy days are often associated with sadness, however in the conducted study, this was not the case. The only variable which had any noticeable effect was the amount of sun time during the day. Seasonal affective disorder can be debilitating. But Beecher’s findings are good news for anyone feeling emotionally and energetically depleted during the winter months. Rather than staying curled up in bed, which does seem enticing, your mood could conversely benefit from doing just the opposite. Getting exposure to sunlight, even if just through a window, has immense benefits on one’s emotional well-being. Taking a walk outside or meeting up with friends during daylight hours is just about the best thing for your mental state during the winter. The correlation of light and mood is dependent on the body’s natural response mechanisms to produce serotonin, a neurotransmitter which helps to elevate the mood; and melatonin, a hormone which promotes sleep. 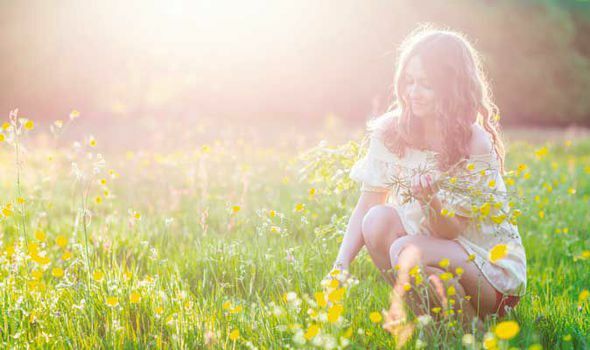 When the body recognizes sunlight through the optic nerve, the gland in the brain which regulates melatonin slows its function, and serotonin levels increase. When light is diminished, the body increases the secretion of melatonin, and the secretion of serotonin is conversely slowed. Just getting outside can do wonders for our health. Living in the developed modern world, it can be easy to forget our natural cycles and our most innate needs. We have synthetic lights, so we do not necessarily need to follow nature’s clock. Yet being in the presence of nature is so essential. It is inextricable from our being, and once we acknowledge this, there is bliss. The Sufi poet Hafiz once wrote a poem titled “It Felt Love.” There’s a lot we can learn from it about our relationship with the sun. Light is the key to our innate flourishing souls. When we open ourselves up to receive the light, our beauty shines forth.